One of the crucial aims of the Freedom of the Streets project is to investigate the ways in which women lived and navigated through the early modern cities of Amsterdam, Berlin and Edo, among others. As is widely known, textual materials written by men exist in abundance, so as we began to consult secondary literature and went through several documental materials in the various archives of Tokyo, our priority was obviously to locate textual materials written by women that talk about Edo in one form or another. The first challenge was therefore to compile a preliminary list of such materials. It became clear while going through the secondary literature (especially that written for an English audience) that most of the essential academic work done on women's lives in the Edo period can be traced back to a small group of scholars gathered under the chairmanship of historian Shiba Keiko (柴佳子), forming a society known as Katsura no Kai (桂の会), and an archive called Katsura Bunko (桂文庫) [http://koki-bo.world.coocan.jp/edo_vrn.html]. This society was formed in 1990 and has devoted itself to searching and accumulating materials written by Japanese women from all over Japan during the Edo period. For a number of years, they published 15 issues of a journal titled Edo-ki Onna Kou (江戸期おんな考 which roughly means "Women's Thinking in the Edo Period"), and following this, they have switched their efforts into transcribing and publishing the materials they have accumulated so far on a number of books. Their most recent opus is a large volume titled Edo-ki Onna Hyōgensha Jiten (江戸期おんな表現者事典or "Encyclopedia of Female Creatives in the Edo Period" in English), which gathers a list of 12000 women from all walks of life in early modern Japan whose personal writings or artistic works have survived to this day. Other notable works by this group include: an encyclopedia of female diaries in the Edo period (近世の女旅日記事典); a series of 3 volumes exploring women's thinking in the Edo period, and the way they were portrayed by male historians during the course of time (江戸期ひと文庫); and two series of critical editions of early modern female writings respectively known as Kinsei Jōsei Sōsho (近世女性双書) and Edo-ki Onna Shiryō-shū (江戸期おんな史料集). The only work of Shiba Keiko available in English language is Literary Creations on the Road: Women's Travel Diaries in Early Modern Japan (2012). Another scholar who has devoted his time to the study of Japanese women in the Edo period is Maeda Yoshi (前田淑): from him we have two compilations of travel diaries respectively titled, Edo Jidai Joryū Bungaku-shi - Chihō wo Chūshin ni - Tabi Nikki-hen (江戸時代女流文芸史―地方を中心に―旅日記編), and Kinsei Onnabito no Tabinikki-shū (近世女人の旅日記集). But having checked all of these extensive scholarly works, the problem remained that we needed a more concise list of materials that described Edo, a task which, to the best of our knowledge, no one has tackled until now. So by referring to the aforementioned works, we have compiled a preliminary list of about 60 manuscript materials written by Japanese women in the early modern period that at least in part mention Edo. Most of these are travel diaries, but it would be incorrect to say that all of these travels were made for leisure: we see women who are forced to either travel to Edo or leave Edo, in function of their husbands having died, or reassigned to a new region (ex: Yokoyama Keiko、露の朝顔); others travelled in hopes of receiving training from masters in the poetic and literary arts, a venture which was considerably more difficult for women than men (ex: Tagami Kikusha-ni, 手折菊 / ふたゝび杖); others travelled to receive medical treatment in hot spring bathing facilities (ex: Ohzuki Tahoko, 更衣日記) and we even have the case of a woman who was arrested and put in a prison in Edo for about 7 months (Kurosawa Toki, 上京日記 / 京都捕れの文). Their writings were not always intended for public diffusion, but were meant rather to memorialize their experiences going through unfamiliar lands. A good portion of our list obviously originated from the hard work of Shiba Keiko, who has already accumulated more than 160 travel diaries from women all over Japan (see近世女性の旅日記から―旅する女性の姿を追って―, Kinsei Josei no Tabi Nikki kara – Tabi suru josei no sugata wo otte). But her list was originally published in 1991, and when attempting to verify or corroborate the location of the documents, we found that some of them have either been moved into other archives, or have become untraceable (especially in the cases of a handful of documents that were in the possession of private family archives). So we still have quite some work to do before we can effectively access all of these documents, not to mention the considerable challenges that involve decoding people's handwriting in the early modern period; fortunately, close to half of them have been made available in annotated editions, which have been transcribed into modern-day Japanese characters, and are therefore much more approachable by scholars. However, even in the case of the annotated editions, another serious issue comes to the fore: judging from the handful of diaries that we have been able to check in this short period (and also from our talks with Japanese scholars), they contain very little information about Edo. For the most part, their references to Edo do not exceed a few simple and concise sentences that merely mention their passage through some lodging town such as Yotsuya or Shinagawa, or simply describe some people that they saw when they were arriving at each place. But having admitted that this textual information is much more limited when compared to the more detailed diaries left by Japanese men, we do often see that these women wrote a couple of verses of waka poetry associated with each place. This in itself is a fascinating aspect, as they were not necessarily interested in describing the dry reality of what they were seeing, but used their trip as an opportunity to flex their creative muscles and recall their early upbringing, in which the learning of classics of Chinese and Japanese poetry played an important role. They did not always create new poems, but sometimes would cite one of the classic poems that they learned in their childhood. So, even though these materials might not contain a lot of mappable information, they still showcase their unique perspective on the urban space of Edo and its scenery. It is beyond the scope of this post to present the full list of the materials we have gathered so far, but there are a couple of noteworthy diaries which deserve a brief mention for being especially detailed and rich in information. First off, we have the writings of Kuroda Tosako (黒田土佐子), namely Ishihara-ki and Koto no Hagusa (石原記, 言の葉草). Tosako was the wife of a daimyo lord stationed in Edo. After becoming a widow, she managed her husband's estate and left the aforementioned two diaries, one written in the mid-18th century and another during 2 or three years in the 1730s. She mostly travelled around the districts located northeast, east, southeast and south of the Edo castle, and usually hanged out with other daimyo wives at their homes, or did street walks with her sons and daughters (who were mostly grownups by the time she writes the diaries). She generally left the house every 2 to 4 days, and inserted poetry and fragments of popular literature within the diaries. Finally, she mentions the dates of fires in the city as well as other important incidents. Secondly, we can mention the diary of Inoue Tsūjo (井上通女), named Edo Nikki (江戸日記). Tsūjo originally came from the Shikoku region to Edo in the second half of the 17th century to serve as a teacher for the children of a feudal lord stationed in the metropolis. Her diary includes the general weather conditions for the period of 1862-63; she lists a number of interesting things that she saw on her walks, such as flowers or folding screens; there are also mentions of official names of some of the lords that she meets with in Edo, although she is not very detailed in this aspect; finally, she frequently lists names of temples that she visits around Edo, and the text is full of waka and kanshi poetry. Her interest in temples is mirrored by many other Japanese women of the time: a frequent reason for their travels involves pilgrimages to temples not just inside Edo, but across Japan, even if some of those sacred sites were off-limits to women (on the account of Shintoist/Buddhist purity laws, which saw female menstruation and childbirth as forms of pollution), in which case they would stay merely at some building near the entrance, having some tea. Praying for a successful childbirth, health and longevity, or for the peaceful afterlife of their deceased husbands and ancestors, were some of the reasons that led them to embark in these journeys. The diaries of these two women clearly show that movement throughout Edo was an inescapable aspect of their daily lives. They were certainly not confined to the precincts of their homes, but leaving the city itself was admittedly more challenging, due to governmental impositions on the movement of women across Japan: since the early Edo period, wives of daimyo lords were forced to remain in the city as hostages while their husbands returned to their provinces, to discourage them from any thoughts of plotting rebellions or conspiracies. This led to strict controls of women entering and leaving Edo, but as Laura Nenzi argues in her work Excursions in Identity - Travel and the Intersection of Place, Gender, and Status in Edo Japan (2008), this did not always discourage them from seeking ways to evade such controls. While Nenzi's work is devoted to depicting human travel across Japan, and is not strictly focused on Edo itself, it does provide very interesting outlooks on how the most famous places of Edo were portrayed and perceived by its inhabitants, and is recommended reading for anyone who is interested in the topic of Japanese travel diaries. For those who wish to get a closer look at the diary of Kuroda Tosako and her trips across Edo, there is an excellent study in English by Marcia Yonemoto ("Outside the inner quarters: sociability, mobility and narration in early Edo-period women's diaries" in Japan Forum, Vol. 21 (3), 2010, 389-401), who also looks at a diary by a relative of Tosako named Nakayama Suzuko. Her travel diary is named Fujii-shi Onna no Ki (藤井氏女記), which unfortunately follows the patterns of most of the diaries that we have encountered so far, by making only very brief and concise references to Edo. Due to the narrow length of Suzuko's diary, Yonemoto resorted to Tosako's writings in order to reconstruct the later life of Suzuko, and it appears that she did move residences frequently, and may have had just as much freedom of movement within the boundaries of Edo as Tosako or Tsūjo. 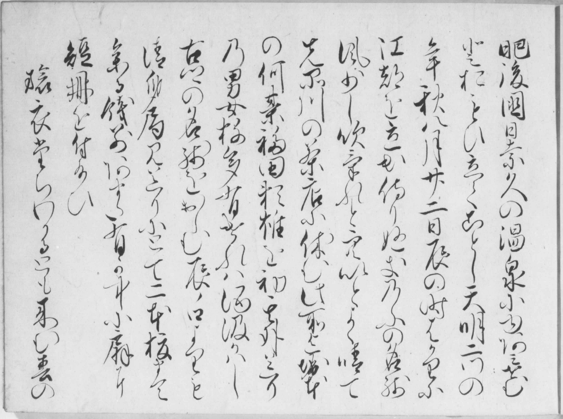 To conclude, it is painfully clear that women are considerably under-represented in historical sources, but we still see them pop up in memos written down in male diaries, such as the one by Saito Gesshin (斎藤月岑日記, Saito Gesshin Nikki). For the most part, they consist of short meetings, possibly to discuss issues related to the neighborhood's daily management, or perhaps just for courtesy. There is even less information about women of low castes, which are sometimes mentioned in legal documents. Overcoming these limitations and showcasing the voices of these women in a balanced manner will be one of the most important challenges of our research project going forward.